Showing 35 articles from January 3, 2018. LOUISBURG -- Deer dog hunters and landowners filled a Franklin County courtroom, arguing their cases before county commissioners who have said now might be the time to update regulations surrounding the sport. Last month, a handful of residents, many of whom are hunters, told county commissioners that hunters who use dogs to hunt deer are creating increasing problems for landowners -- as the dogs crisscross their land, damage property, scare livestock and disturb their peace of mind. In the photo above, a bright yellow tractor pulling a bright yellow trailer provided a welcome display of color on an otherwise dismal winter afternoon. The tractor was driven by Otha Hill. 2018 is off to a c-c-c-cold start! 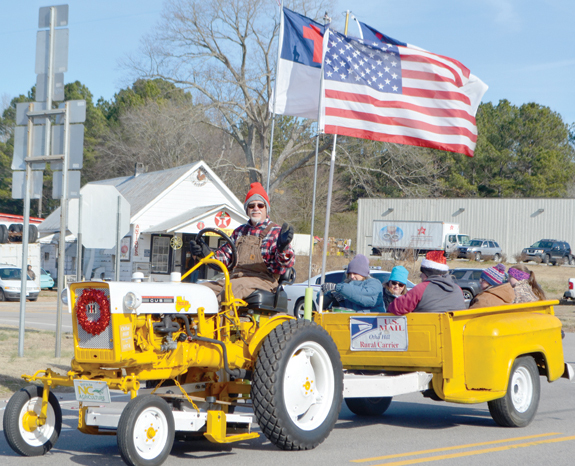 Kicking off a new year with a parade is a long-standing tradition in the northern Franklin County community of Centerville. And the tradition continues regardless of the temperature or the weather. 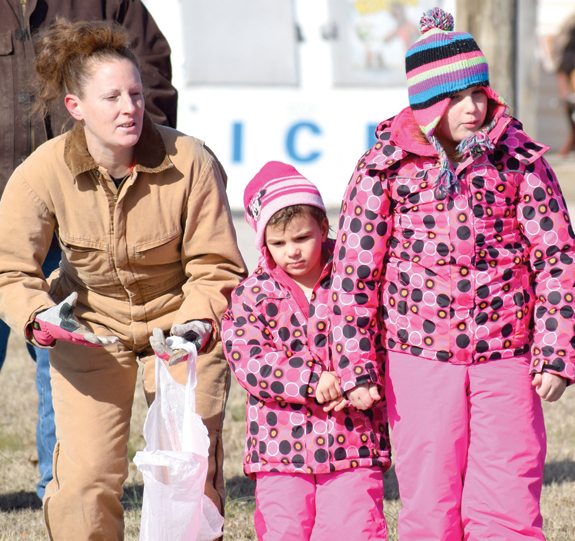 New Year's Day was chilly -- well, actually downright cold -- but lots of folks bundled up in their winter duds and either participated in the parade or lined the highway to watch their friends and neighbors help usher in a new year. LOUISBURG -- Attorneys have filed what they intend to be a class action lawsuit, alleging operators of several nursing homes, including one in Youngsville, placed residents in danger because of their poor staffing levels. A judge, though, will have to determine if the case meets the criteria to proceed as a class action matter. 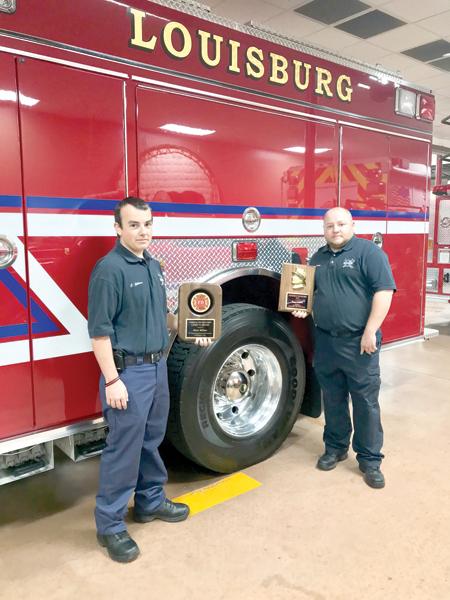 The Louisburg Fire Department recently held its 2017 Christmas banquet and awards ceremony. The 2017 Firefighter of the Year was Bryan Denton (right) and the 2017 recipient of the Chiefs Award was Chris Gilliam (left). Other awards of recognition were: 10-year service award, Captain Ramey Seal, firefighters Adam Smith and Shawn Best; 20-year service award, Assistant Chief Russell Bottoms, firefighter Cornelius Alston; 45-year service award, Deputy Chief Larry Peoples. 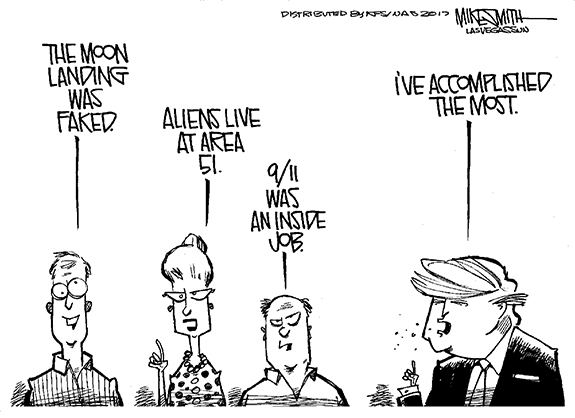 Good news is real news, just not all of it! Believe it or not, it's a new year full of hope, promise and opportunities -- and, undoubtedly, a few challenges along the way. 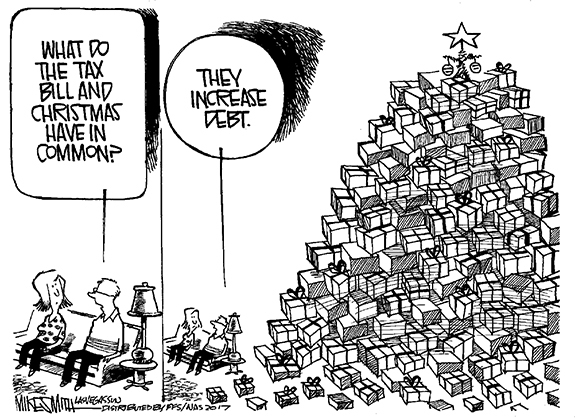 Here's hoping that you and yours had a safe, enjoyable holiday season and that the new year lives up to its potential, without too many of the challenges. Interestingly, we finished out 2017 on a very positive note with an unusual front page for us that featured all "good news" about the activities of Franklin County folks. It's too early to know if this week was an indication of things to come, but 2018 got off to a fiery -- some might prefer to say barking -- start. The commissioners ended the holiday season doldrums by tackling one of the most controversial topics county officials usually ever face, hunting. And in this case, it was deer hunting with dogs. 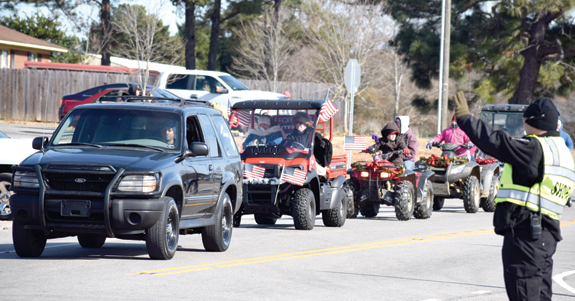 As the calendar was switching over from 2017 to 2018, the town of Youngsville is dealing with a little bit of old. And, they're bracing for a whole lot of newness. 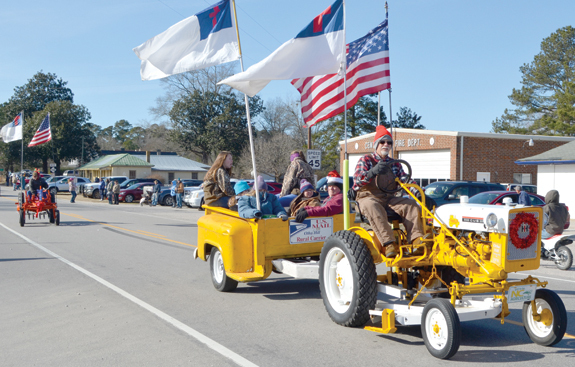 At the end of 2017, the Youngsville Fire Department unveiled the town's first fire truck -- a 1963 Chevy -- during the town's annual Christmas parade. The fire department recovered it at a junk yard a few years ago and began efforts to restore it. The fate of 800,000 or so "dreamers" continues to confound members of Congress, even as a deadline of March 5, rapidly approaches. On Sept. 5, 2017, President Donald Trump gave Congress six months to decide to rescind or reinstate President Barack Obama's Deferred Action for Childhood Arrivals (DACA) Executive Order. My position on the editorial "Thoughts on our Monument" by Professor Will Hinton is that I agree with his call to action. Being a student at Louisburg College, we are forced to encounter this Confederate monument that stands for hate and racism in the south. RALEIGH--Funeral services for Kenesha "Breezy" Latrice Wilson, 25, who died Monday, Dec. 25, 2017, will be held Saturday, Jan. 6, at 1 p.m. at Olive Branch Baptist Church in Wake Forest, with the Rev. Earnest Williams officiating. Burial will follow in the Wake Forest Cemetery. BUNN - Nannie Bolden, 80, died Monday, Jan. 1, 2018. Arrangements, William Toney's Funeral Home, Spring Hope. FOURTEEN FOR TWO. Northern Nash High School's Jordan Lynch (with ball) drives for a basket as Bunn's Darrius Caldwell defends during the championship game of the annual Bunn Boys Basketball Christmas Tournament last Friday night. FRANKLN COUNTY -- The winter weather expected to come through the area Wednesday has thrown a wrench in the early-2018 sporting plans of Franklin County's high schools. Franklinton's scheduled basketball meeting on Wednesday at Bunn has been postponed. A make-up date has yet to be announced. 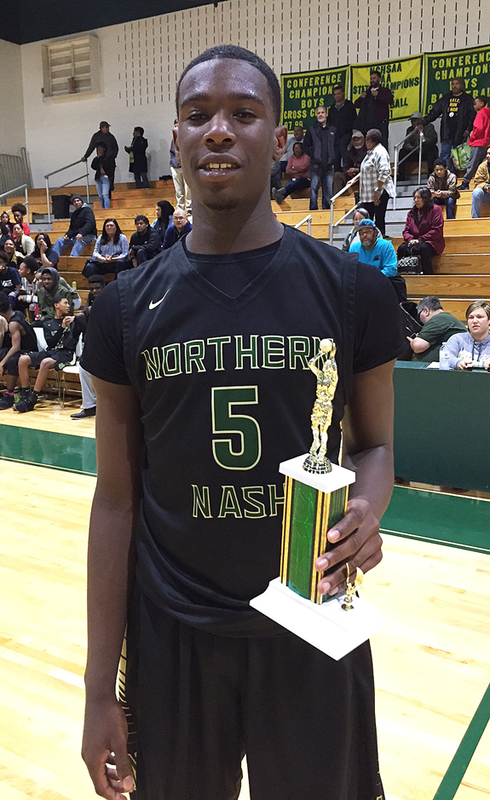 BUNN -- In the estimation of veteran coach Henry Drake, Northern Nash's strong second half to the 2016-17 season actually began with a disappointing loss. That setback came at the Bunn Christmas Tournament as the Knights were topped by Wake Forest in stunning fashion in the opening round of the annual event. The defeat seemed to jolt Northern, which would only lose one more time before making it all the way to the quarterfinals of the Class 3-A State Playoffs before dropping a heartbreaker to Eastern Guilford. A TRUE HALL OF FAMER. 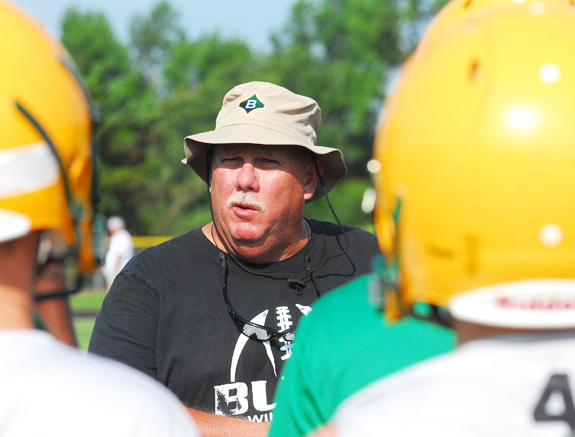 Retired Bunn High School football coach David Howle will be inducted into the BHS Hall of Fame next Friday night. BUNN -- Two legendary coaches and one amazing team will be saluted next Friday in the latest induction ceremony of the Bunn High School Hall of Fame. The Hall, which is overseen by the BHS Booster Club, will welcome recent retired coaches Henry Jones (volleyball) and David Howle (football) as part of a ceremony between the girls and boys games of a Northern Carolina Conference showdown with Southern Vance at the Bunn Dome. STRONG MOVE. Bunn's David Rogers (left) takes the baseline for the Wildcats during last Wednesday's tournament triumph against Southern Nash. BUNN -- Bunn High School boys basketball coach Patrick Reynell thought his club played 11 solid quarters out of 12 at the annual Bunn Christmas Tournament. 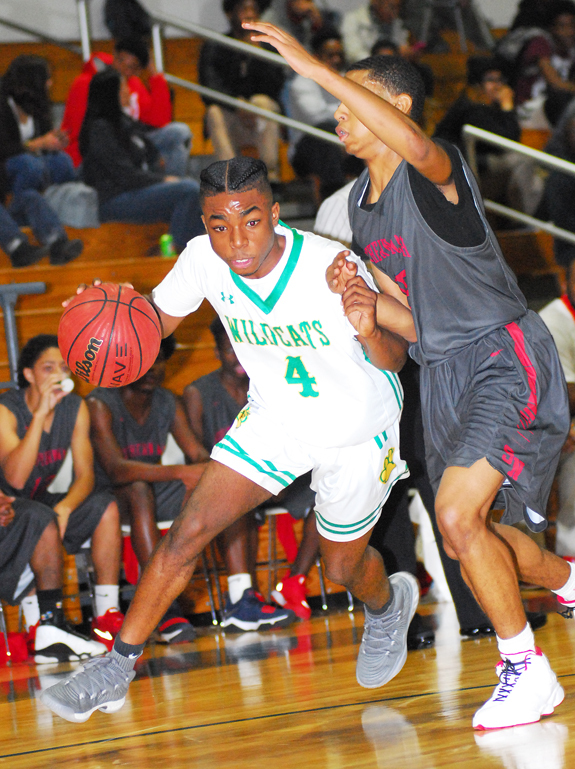 But that one subpar frame kept the Wildcats from competing for a possible championship at the event, which concluded last Friday night at the Bunn Dome. 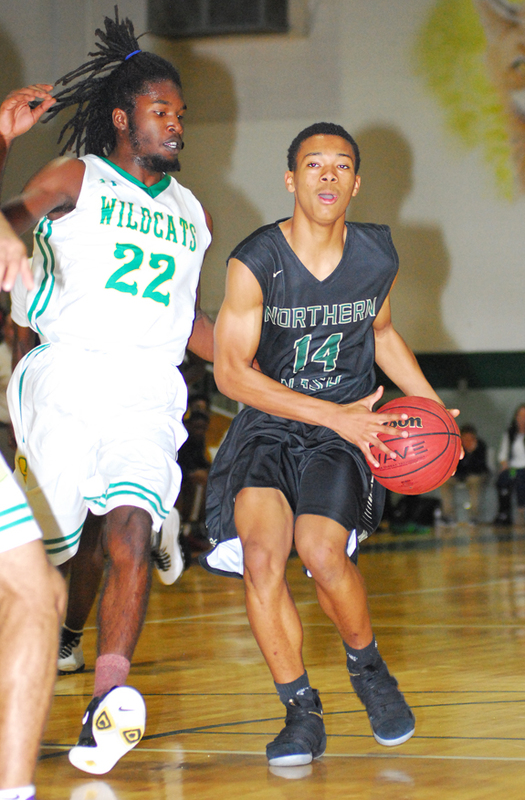 In the championship contest against a talented Northern Nash club, the Wildcats saw NN score 21 of the 23 points registered in the initial frame of action. RALEIGH -- The 68th Annual Raleigh Hot Stove League Baseball Banquet will be held January 23 at the McKimmon Center on the campus of North Carolina State University in Raleigh. Several area diamond dignitaries will be honored. Pat O'Conner, the President of Minor League Baseball, will be the special guest. PIKEVILLE -- Bunn put together a strong performance at last Friday's Falcon Invitational Wrestling Tournament, which was held at C.B. Aycock High School in Wayne County. 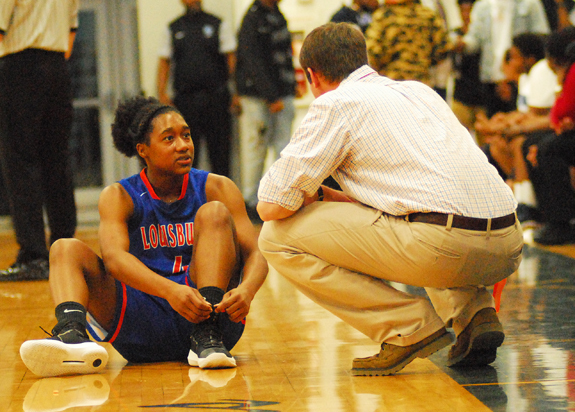 Domonique Branch (left), shown discussing strategy with Coach Chris Baker, and the Louisburg Lady Warriors were slated to begin their post-holiday basketball schedule Wednesday at home against East Wake Academy. But that game was postponed and tentatively moved to Feb. 2. Weather permitting, Louisburg will travel to Bunn this Friday night. 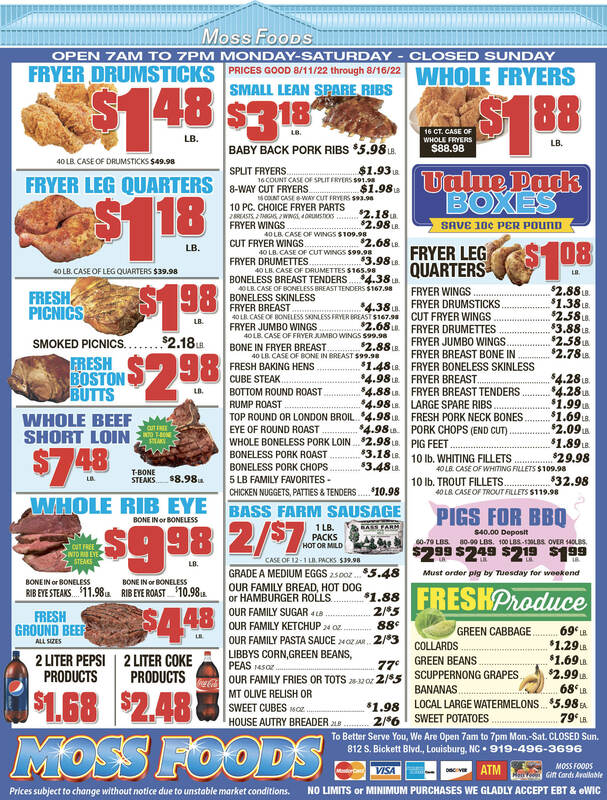 Two Louisburg area residents captured the first and second place spots in the recent Franklin Times football contest. Winning first was William Cary of Terrell Lane, Louisburg. Coming in second was Hubert Alston of West River Road, Louisburg. LOUISBURG -- The Franklin County Board of Education has scheduled a special-called meeting for tonight (Jan. 4), but it was not immediately clear if the board would discuss the employment of a recently reinstated principal. During a Dec. 11 Franklin County Civil Superior Court hearing, attorney Mary-Ann Leon argued that the school system erred when it fired her client, Melissa Britner, as principal of Royal Elementary School. 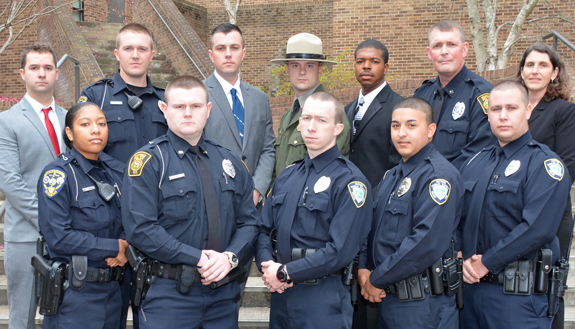 HENDERSON -- Eleven cadets graduated from the most recent Basic Law Enforcement Training (BLET) program at Vance-Granville Community College. 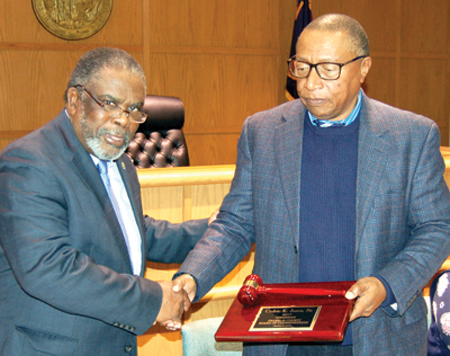 They were recognized in a Dec. 12 ceremony held in the Civic Center on the main campus. After passing the state certification exam, all are authorized to work in any law enforcement agency in North Carolina. LOUISBURG -- The Franklin County Board of Commissioners agreed to give themselves more time before agreeing to make changes to its purchasing policy. The current policy is nearly 11 years old and county management, along with leaders in the offices of the sheriff, planning and inspections, library, health, finance, social services and maintenance figured it was time to revise the policy. NASHVILLE -- A longstanding business in Nash County, that also has strong ties to Louisburg, was destroyed by fire on Tuesday night. Nashville's Fire Department was dispatched to Richardson Funeral Home around 6:20 p.m. Tuesday. The business is located at 204 North Alston Street in Nashville. "We got there and it was a working fire," Battalion Chief Scott Whitford said. "There was a lot of smoke coming from the building." LOUISBURG -- Police continue to look for a man they allege robbed a bank at gunpoint last week. They released an image that they hope leads to an arrest. According to Louisburg Police Chief Jason Abbott, a man entered the Carter Bank and Trust on Bickett Boulevard at about 1 p.m. on Dec. 27 and demanded money. LOUISBURG -- Franklin County sheriff's deputies are looking for a man who robbed Ingleside Grocery in the 3500 block of N.C. 39 North at about 9:30 a.m. on Jan. 1. The suspect, described as a light-skinned black man wearing a camouflage mask over his face, pulled out a gun and demanded money. A Christmas program, "Toys for Tots," was hosted by the Rev. Maxine Miles Perry on Saturday, Dec. 16, at Bunn High School, sponsored by the Rev. Perry and Got Truth International. Numerous toys were collected and distributed. Following registration, lunch was served. This event was a time of food, fun, fellowship and family. Rev. Perry thanked everyone who helped make this program a success -- donors, volunteers, patrons. 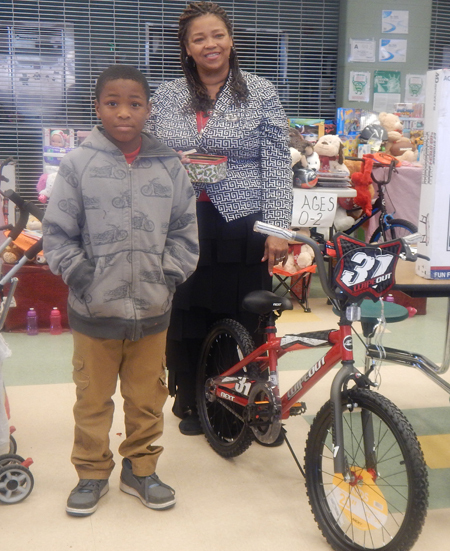 Shown above is Damiehn Thorne with his new bicycle and Rev. Thorne.